Stats: From trailhead to peak: 1.8 miles, 1,411′ gain; from peak to trailhead 1.8 miles, 1,411 loss; round trip: 3.6 miles 1,411′ gain and loss. Route description with trail segment pages: From the trailhead, take the Lower San Gabriel Peak Trail to the junction with Mt. Disappointment Road. Proceed up Mt. Disappointment Road to the Saddle between Mt. Disappointment and San Gabriel Peak. At the saddle, turn east (left) and proceed a short distance, go down the trail leading off Mt. Disappointment Road, and continue up past the junction with the South San Gabriel Peak Trail. 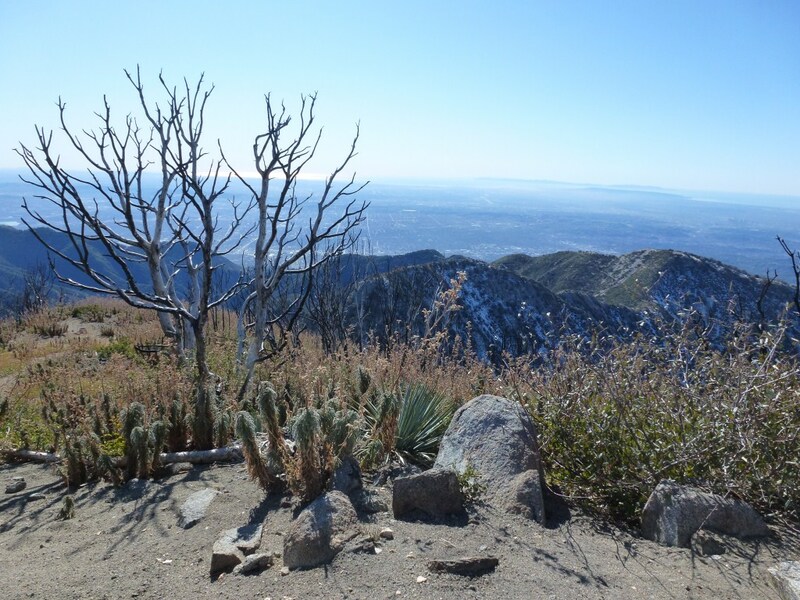 Continue up the Upper San Gabriel Peak Trail to the peak. Looking down on Mt. Markham and Mt. Lowe with Catalina Island off in the distance. Wow this looks really fun! Do you think there’s snow on this trail now? No snow right now. However, the peak is above 6,000′, so keep an eye on weather. It will be covered in snow several more times this year. Also, this trailhead is very close to the Red Box parking area making it easily accessible even if the gate at Mt. Wilson Road is closed. The last time I snowshoed this trail the gate was closed.